NHL 18 HUT Beginners Guide - Christmas Edition! This is a mid-season quick start guide targeted primarily at all the new players just getting the game. I’ll cover the important bits of what you’ve missed in HUT so far and also some useful resources that you may or may not be aware of yet. You should see a table of contents on the right, feel free to jump around to any section that interests you – this guide doesn’t need to be read top to bottom although I do recommend it if you’re brand new to the game. You have likely already heard that there are new dekes in NHL 18 and also a new defensive mechanic called the Defensive Skill Stick. These aren’t specific to HUT by any means but mastering them will make you a better HUT player. I have all the new dekes covered in-depth in my NHL 18 new Dekes Guide. Head over there when you want to learn how to master them all. The Defensive Skill Stick finally adds more tools for defenders to utilize. You can now hold down the poke check button(R1 or RB) to hold your stick out and get it into shooting or passing lanes. It also works well for angling your opponents towards the boards. You can poke check while in Defensive Skill Stick by pressing R3(right analog stick). To see it in action check out Brianstormed’s NHL 18 Defense Tips video below. The DSS part starts at 4:17; however, the whole video will be very helpful if you’re new to the game. In the past, you always had to have your friend at your house to play coop multiplayer versus other teams via “couch co-op.” That is now a thing of the past! 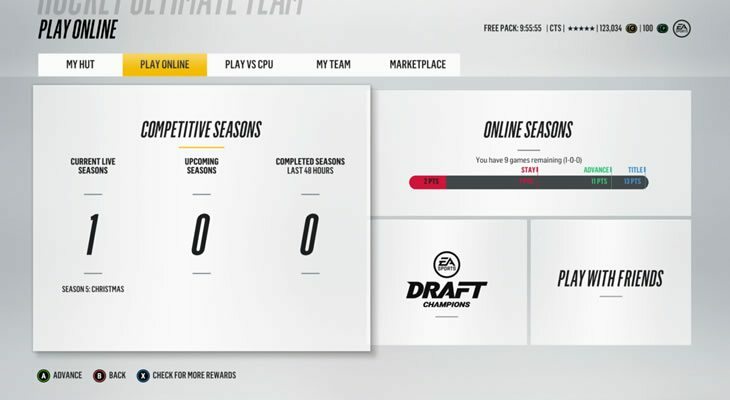 in NHL 18 you can invite your friends to play online versus and even HUT online seasons together on the same team versus other human players. The only bummer here is that if you play HUT online seasons together only one player will earn any coins for the win. *You CANNOT play HUT competitive seasons on the same team. Competitive seasons does not allow any other players to join, must be 1v1. There are some other more minor changes in NHL 18 versus NHL 17 that will be really help to know. Such as button changes for certain actions like Hipcheck or Puck Chop. Check out my must-know NHL 18 tips those and more. If you aren’t new to HUT, then skip to the next section. For those that are brand new to HUT here is a quick explainer on how it works. To no surprise, it is about building the ultimate hockey team. When you first start playing HUT, you will receive a starter pack with a bunch of players that will make up your first team. Throughout your HUT career, you will be able to sell, buy, and earn more players to improve your team. Some consider it a “pay to win” game mode, which is true in the sense that if you pay money for card packs, you will have an advantage over your opponents in terms of better players. Having said that, we’re over three months into NHL 18 now, and there is no shortage of high overall cheap players so you can build a great team on a small budget quite easily this year. There are four ways to play online. Draft Champions: The main set rewards for Draft Champions are 85 OVR players, which at this point in the year are completely useless. Unless EA Sports updates the rewards or you just enjoy drafting players, there isn’t a lot of benefit in playing this game mode. You do have a chance at receiving a random player item related to the Draft Champion theme you chose if you win all 4 games, but it could also just be another Draft Champion collectible. In my opinion, if you’re going for maximum return on your time then DC isn’t worth it at the moment. Play with Friends: Unranked games setup between friends. A great way to ruin friendships without any rewards. They do keep the record versus each friend, so when they get over you crushing them and finally talk to you again, then you can still visually remind them how much better you are. Online Seasons: The traditional HUT game mode. Work your way through 10 divisions progressively earning more coins and rewards as you go. You will get a Division Title pack for each title you get. These include four random items, the higher the division, the higher the chances of getting a Gold Rare player or valuable collectibles. Division 1 titles packs guarantee at least a Gold Collectible, and you have a chance at a Carbon Collectible. *All Division Title pack items are untradeable. Online Seasons is a good mode for your casual HUT player who wants some competition but isn’t planning on getting sweaty because you don’t miss out on much if you lose. You can re-do the divisions as many times as you want until you win the title and move up. Competitive Seasons: My favourite game type in NHL 18! Not for everyone, but if you’re a competitive NHL player at all then this is the mode for you. The potential for great rewards is much higher than in online seasons. It’s not only for top level players either. The great thing about competitive seasons is that it is skill based matchmaking, so if you are ranked low then you should play against other players at your skill level and slowly work your way up while improving your own skill. Competitive Season lengths vary depending on the season. They are made up of rounds and could be a few days each or a week each. You will receive rewards after each round and after the whole season, the better your ranking the better the rewards. If you’re wanting to watch a top level HUT player then I suggest checking out NugeTV on Twitch. He streams almost every week day and always ranks in the top 50. There are also four ways to play offline in NHL 18. Team of the Week: Same as previous years, you can play the team of the week to earn some coins. I’ve never actually done this myself as I’m more of an online vs humans kinda guy but my understanding is that it’s not worth your time. Exhibition Game: Unranked game versus CPU. Much like playing offline versus, but you get to use your HUT team. Single Player Seasons: Similar to Online Seasons except there are 14 divisions instead of 10 and you only play against the CPU. The further you advance in divisions the better the rewards get and more difficult your opponents will be. HUT Challenges: The new exciting addition to NHL 18! You now have the opportunity to earn packs, coins, players, and various rewards from completing “HUT challenges.” You can see an example of one of my NHL 18 HUT challenge tips post. Read more about HUT challenges in EA Sports HUT Challenge Deep Dive. This is likely the most informative section of this guide. Most of the previous content would have been relatively easy to figure out on your own; however, there are some changes to the way EA Sports releases sets and cards in NHL 18. I will only cover the current limited time and ongoing sets. The limited time sets that have already passed won’t matter to any new players just starting their HUT career. 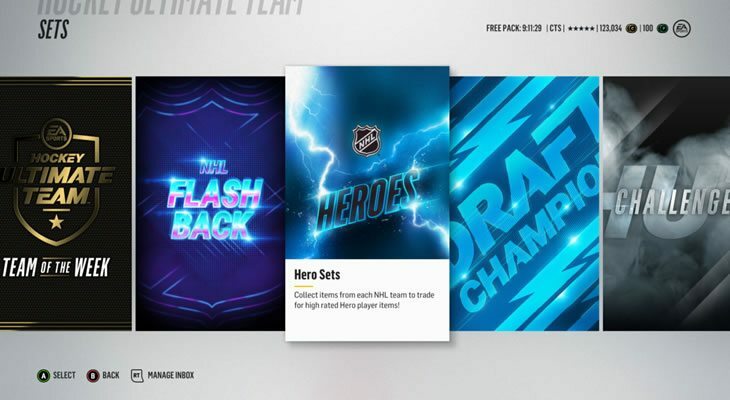 Ice Set: This was a massive update that resulted in over 100 players being upgraded based on their real-world performance up to this point in the NHL season. 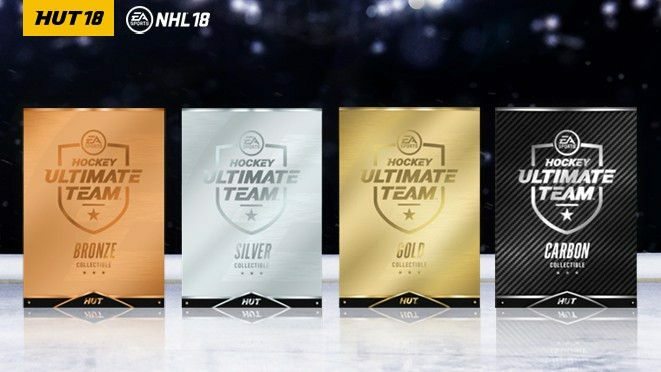 This set contains all those players; you can upgrade their base card by combining it in this set with a Gold collectible to get the improved “Ice” version. All the sets are available until February 2nd. View all Ice Player Upgrades. *You MUST do one of the following actions in the list by January 3rd, or you won’t be eligible for the reward. View full Gift of Giving Set details on EA Sports. As alluded to earlier, some of the ongoing sets only show up on specific days. We’ll cover those below. First, I’ll list out all the sets that are always showing in the Sets area. Team of the Week: Trade in Bronze or Silver collectibles for their respective bronze or silver TOTW players OR trade in TOTW collectibles for Gold TOTW players. Flashback: Trade in Flashback Master collectibles for various players from an 88 OVR Matt Cullen to 99 OVR Martin Brodeur – More on Flashback collectibles in Flashback Friday section. Draft Champions: You can trade in Draft Champion collectibles for various 85 OVR players here. 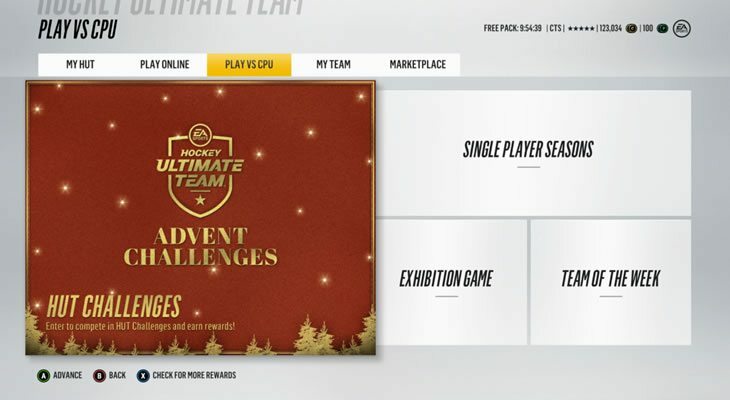 HUT Challenge: You earn challenge collectibles for completing HUT challenges and can trade them in here for various rewards including consumables, bronze players, silver players, gold players. HUT Tips: Trade in HUT Tips(found in packs) for a pack of various consumable items. Contracts and healing cards. Upgrade: Upgrade your collectibles or players. Similar to last year, trade in X number of bronze or silver to upgrade them to silver or gold. SunSets: Trade in Master collectibles for a special item from the current event or trade in expired set collectibles for random Gold Rare Players. Every Monday at 5pm EST NHL 18 releases the HUT Milestone set that requires 4 Milestone collectibles and can only be done once per week. Completing the Milestone set will get you a pack that contains one guaranteed Milestone card from the previous week. Milestone Collectibles: Found only in packs or by purchasing them from others in the Auction House. *Players get Milestone cards based on hitting real life Milestones in their career. Prime Time player items are earned based on single-game performances. Sort of like a play of the night sort of idea. Very similar to last years “Player of the Game” cards. The Prime Time set is available every Tuesday at 5pm EST for 24 hours and can also only be completed once. The pack will contain 1 Prime Time card from the previous week. Prime Time Collectibles: Found only in packs or by purchasing them from others in the Auction House. Prime Time Tracker: Again, HUTDB has a handy tracker to see what players will be available in the current weeks Prime Time packs. Returning HUT players will be very familiar with this set. TOTW stands for Team of the Week and is made up of players that played well during the previous week. There is a mix of both offensive and defensive forwards; it’s not purely about putting up points – players that had a great week defensively can make the team too and receive an upgrade. Team of the Week Collectibles: Found in packs or buying them in the auction house from others. Team of the Week Tracker: HUTDB has a nice tracker for seeing which players may get a TOTW item the following week and also for tracking who got one the previous week. The most valuable cards in the game! Evolution cards, also known as “EVO,” have replaced MOV cards as the only type that upgrades with the player’s real-life performance. So each time an NHL player earns a new player item whether that be Milestone, Prime Time, TOTW, etc. it will upgrade their EVO player item as well if they have one. New EVO cards and an EVO set are released every Thursday at 5pm EST. The set requires 5 EVO collectibles and 1 Carbon collectible. EVO Collectibles: These are only found in packs and are the rarest collectibles you can get from a pack. You can also earn one EVO per week by doing the EVO HUT challenge. A challenge is released every Thursday, but keep in mind that the set and challenge must be completed within 24 hours from the time they are released. **EVO cards only upgrade with PERFORMANCE based upgrades. So if a player receives a limited time set based upgrade that isn’t given based on their performance, then the EVO won’t receive an upgrade with it. For example, the Gift of Giving Master Set Burns 90 OVR wasn’t released based on real-world performance; it’s just part of a special set so Burns’ EVO wouldn’t receive an upgrade in that case. With that said, Burns’ EVO is already a 91, so it doesn’t matter in this case. EA Sports releases a new Flashback card every Friday at 5pm EST. You can get it by trading in 4 Flashback collectibles. You will also get a Flashback Master collectible by completing the set, and you can save those up to use them in the previously mentioned Flashback sets. 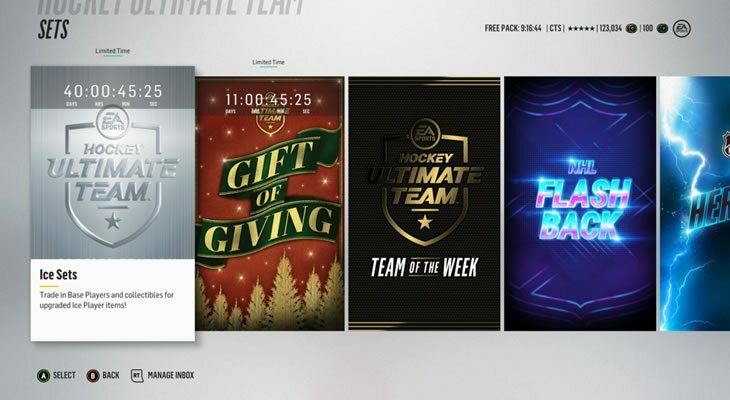 The Flashback set can only be done once per week, so if you want that 99 Flashback Brodeur, you will need to save up your master collectibles for 20 weeks. In addition to the Flashback item, EA releases a Flash Forward item once per month – on the last Friday of each month. The Flash Forward item usually goes to the best performing rookie of that month. There have only been 2 Flash Forward players released so far. Flash Forward Collectibles: Found in packs or by buying them in the Auction House. The Flash Forward set is also only available for 24 hours, and then it is gone until the next month. Base collectibles consist of Bronze, Silver, Gold, and Carbon – as seen above. You may be wondering how to get base collectibles. In previous years you could trade in coaches, arenas, logos, and jersey items for their respective collectible type; however, that is no longer the case for NHL 18. In NHL 18 the only way to get base collectibles is via packs. That includes buying packs from the store and also earned packs from Online Seasons, Competitive seasons, or offline seasons and challenges. Of course, you can always buy them from the Auction House as well. A collection of useful resources regarding NHL 18 HUT. An absolute must-use if you plan on playing HUT. HUTDB makes building your team 1000x easier than if you were to try and search and build it through NHL 18 menus alone. With HUTDB you can easily search for players by synergy, position, overall, card type, etc. I recommend signing up so you can also save your teams as you go. You can find my current team here. ChelTips Team on HUTDB. If you’ve played HUT before, you know how time-consuming it can always be having to check prices to see which cards you can afford or how much you can sell a card for. Brianstormed’s price tracking doc is a MASSIVE help for this. He updates all the most popular cards daily so you can easily check the prices. They are updated at roughly the same time each day too, which is nice for historical consistency as prices can fluctuate throughout the day. You can follow Brianstormed on Twitter for doc updates. NHL 18 HUT is updated almost every week day with new items so if you want to be among the first to know then make sure you follow EA Sports NHL Twitter and also Dontbesaad20. I don’t know anyone more consistent and dedicated to sharing new release info as fast as Saad does. Last but certainly not least. If you want to just chat about HUT with other fans of the game mode, then Reddit’s NHLHUT subreddit is by far the most active and helpful community that I know of. New release info will show up on Reddit quick as well. I hope his guide has got you up to speed on HUT and provided some useful tips to get you jump started in NHL 18. Instead of being a Christmas noob you will be destroying them with the rest of us! If you have any questions you can comment below or tweet me. For more NHL 18 tips subscribe below and/or follow ChelTips on Twitter.